We designed SpringBoard English Language Arts to focus on the same essential knowledge and skills that the Evidence-Based Reading and Writing sections of the SAT, PSAT/NMSQT, PSAT™ 10, and PSAT™ 8/9 assess. To be sure that we succeeded in aligning SpringBoard ELA with the tests in the SAT Suite of Assessments, we conducted a research study. The results of that study showed strong to exemplary alignment1 between each SpringBoard ELA course and the corresponding SAT Suite test. This means that SpringBoard ELA students are getting ready for the SAT, PSAT/NMSQT, PSAT 10, and PSAT 8/9 in the classroom every day. SpringBoard ELA courses for grades 7, 8, and 9 align to 45 of the 48 Evidence-Based Reading and Writing content dimensions on the PSAT 8/9. 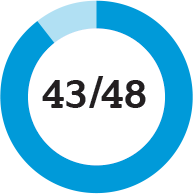 SpringBoard ELA courses for grades 9 and 10 align to 43 of the 48 Evidence-Based Reading and Writing content dimensions on the PSAT 10 and PSAT/NMSQT. 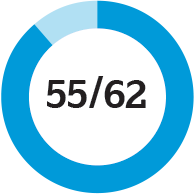 SpringBoard ELA courses for grade 11 align to 55 of the 62 Evidence-Based Reading and Writing content dimensions on the SAT. 2 Note: The limited alignment to Standard English Conventions is largely a result of comparing the progressions of specific grammar and usage skills across grades to the static assessment content dimensions. In many cases a content dimension is addressed in a grade or grades before those considered in the alignment.